As I mentioned earlier, we, (ok actually me) kept piling on new things that we ( really mostly Dean) needed to get done this Spring. New construction, new plantings on top of all the other things we usually do in the Spring. And of course, Dean’s consulting work happened to get crazy busy and stressful this Spring too. I’m so thankful our son-in-law, Matt. He is not only a good husband and dad, but a thoughtful son-in-law too. He stops in and pitches in when he sees a need. We had to replace our deck last year and the railing turned out to have these very fine splinters. He came up and sanded it so smooth without even being asked. He also loves animals and likes spending time with and helping care for them. We have discovered he is a bit of an animal whisperer, from catching shy kittens and chicks to finding Caddy’s favorite spot to be scratched. 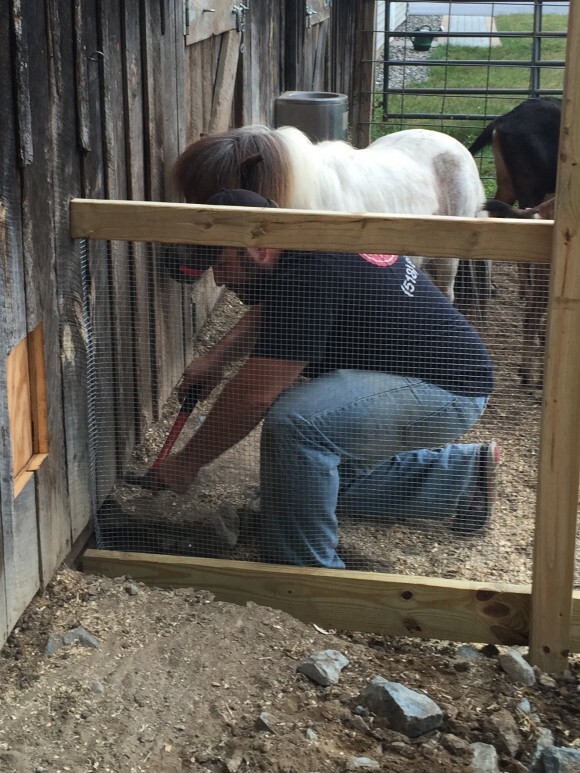 Lately Matt has also been coming up to help Dean finish the chicken coop. The thing is Matt is really good at this kind of stuff so it is more Dean helping Matt. I like seeing them enjoying working together. We feel blessed that Matt is part of our family. Posted by Maryclaire Mayes on Thursday, June 30th, 2016 at 06:00 and is filed under General.